My son has an artist's spirit. Most children do. They approach art with bold and barefaced joy, excited about color and shapes and the simple joy of creating. They don't think too much. They don't carry with them the baggage of preconceived notions from art classes, books, peers, society... They're wild and it's beautiful. They also observe constantly. 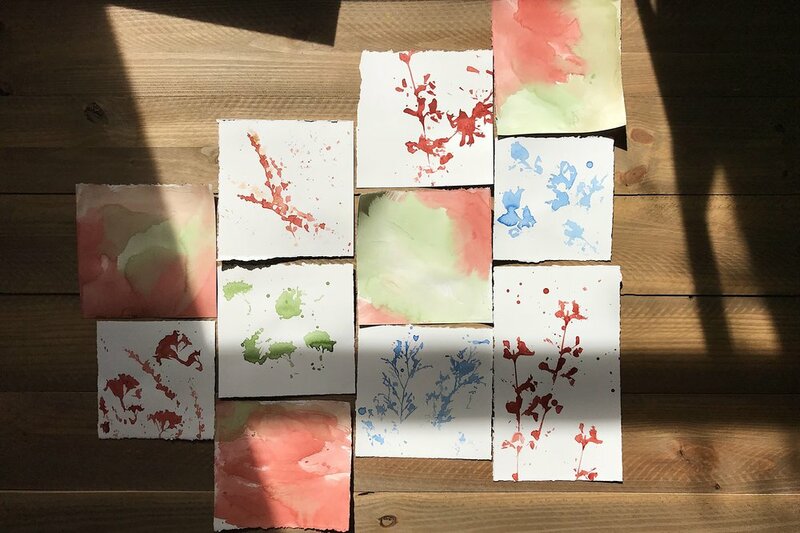 So, when I started using clippings from our garden to paint (or print) this past week, SJ was of course curious and wanted to try for himself. On his birthday (my big-hearted four-year-old! ), I prepared the supplies and we collected the clippings together. Such an easy activity and the results are lovely. Because I have a whole arsenal of artist-quality materials, I tend to use them for our crafts together and I'll list them below. That said, it's completely unnecessary, and I'll include a more cost-effective option, too. I included links to Amazon for convenience! 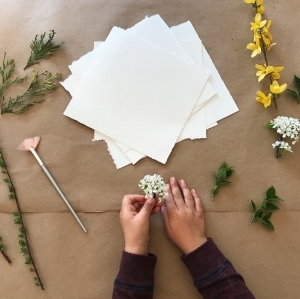 We used white cotton Stonehenge paper, which takes paint beautifully, but any kind of heavier paper like Canson Mixed Media or Canson Acrylic Paper would work. Of course, you could use whatever you have on hand, too! The heavier papers are just great because they are intended to take wet paint and don't warp. I'm a huge fan of Golden Acrylics, especially their Heavy Body and Open lines. For this, I watered down some Heavy Body paints in a few colors (putting a dab of paint and slowly adding a little water to make an opaque puddle of rich color). For stronger color, add less water! Children's acrylic paints, like this acrylic paint set, tend to be very affordable and would work well, too. These aren't available on Amazon! :) Head outside, and take along your wide-eyed curious kiddo(s) if available, and clip whatever looks like it might have an interesting shape or texture. We picked some leafy sprigs, a Forsythia branch, small bunches of flowers, and bits of evergreen. It's best to get a variety, so you can experiment. Some will turn out beautifully, some might not - and the least expected might surprise you! I prepared the paint in plastic takeaway lids, but any dish or tin you feel comfortable using will be fine. It's easier if the container is a bit larger to fit the clippings, but not necessary - as you can see from my pictures! Lay the clipping on its side in the paint and press it down to make sure it's fully saturated. When you lift, give it a tap to remove some of the excess, and then lay it on the paper. Depending on the results you want, you might want to press down with your hand or a piece of wax paper to make full contact. Be sure to lift carefully to avoid too much smudging. The real fun is experimenting! Try different layouts and colors. We used a different color for each of the different clippings, and SJ was very particular about not mixing on each page (who am I to argue with his artistic vision? ), but the possibilities are endless. They're just busy creating and exploring. As we created, I loved having the opportunity to ask SJ what he was thinking and why he was making certain choices. He was so incredibly decisive! He was also very observant, talking about how the paper absorbed the watery paint ("it's drinking the paint in!") and how the different clippings created different shapes. In the end, I think creating with children does two things, which might seem at odds with each other, but are actually complementary. First, you stop thinking so much. You stop planning. You create by intuition. You just do it. Second, you actually think more. (Hey, I said they seem at odds!) But you think differently. You notice different things. You stop thinking about what you should be doing, because you're noticing and considering the finer, more interesting details. They lead you along with a new perspective. While we're often focused on getting something 'right," they're just busy creating and exploring. Rise + Wander is a participant in the Amazon Services LLC Associates Program, an affiliate advertising program designed to provide a means for us to earn fees by linking to Amazon.com and affiliated sites. We also participate in Blick's affiliate program. This said, the following opinions are based solely on my experience and preferences, written with no regard to the affiliate programs.